It's the wintery time of year in the northern hemisphere, when gardeners think about the coming growing season, and when iris seeds are distributed from seed exchanges. When PCI seeds are fresh, plant them immediately, and within weeks seedlings will appear. But who has fresh seeds? To send seeds to a seed exchange, they must be thoroughly dry, or they will mold in the seed packets. Alert readers will recall that I wrote about this last fall. 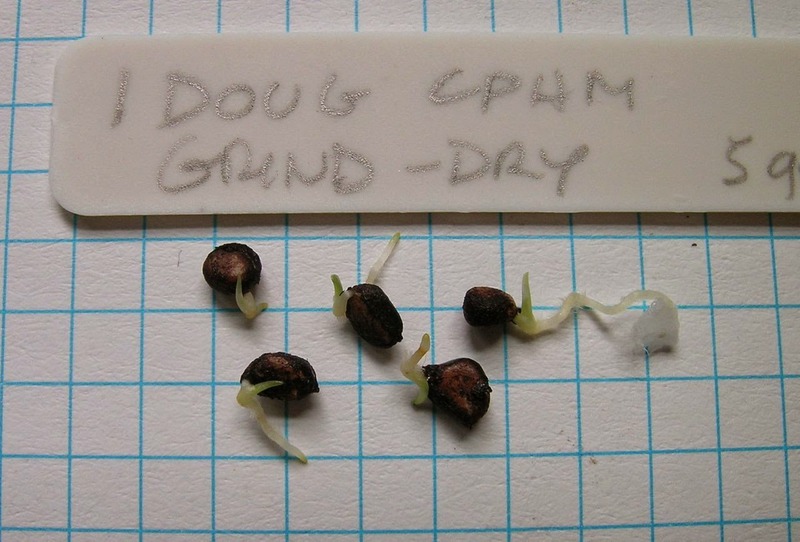 Once PCI seeds are dry, they may have to be coaxed into germination. If those seeds are more than three years old, the coaxing might have to be pretty thorough. PCI 'Mission Santa Cruz' is an older variety, and one I return to again and again for new seedlings. The plants are sturdy in the coastal Pacific Northwest climate, and flower color is dark and near-red. Unfortunately, in 2014 I did not get any seed from this plant. First, PCI seeds don't like 'warm' conditions for germination. 'Warm' when compared to many cultivated perennials is 60 F and above––in a cool to warm greenhouse, for example. PCI seeds germinate best between 40-55 F; the actual temperature varies with the species. Tenax and innominata like cooler temperatures, munzii definitely prefers the warmer end. Most hybrids germinate towards the warmer end of the range, around 50 F, though it's always better to stay on the cool side with any PCI seed lot for which the genetic source is unknown. Second, if the seeds are truly fresh, and were not completely dried, then plant them immediately in well drained potting soil. Soak the pot with several waterings, put them somewhere bright and cool, and stand back. They will be up within weeks. Third, if the seeds are old, particularly more than three years old, it may help to presoak them in fresh water. Presoaking can be in a dish of water, a small plastic bag, or in a mesh bag hung in the water tank of your toilet. Keeping the seeds at 40-50 F while presoaking may also help; my soaking seeds are kept in an unheated shop that stays between 40-55 degrees all winter. Fourth, scarify them, removing some of the seed coat by gently rubbing the seeds between two sheets of fine sandpaper or scrubbing them gently in a food mill. 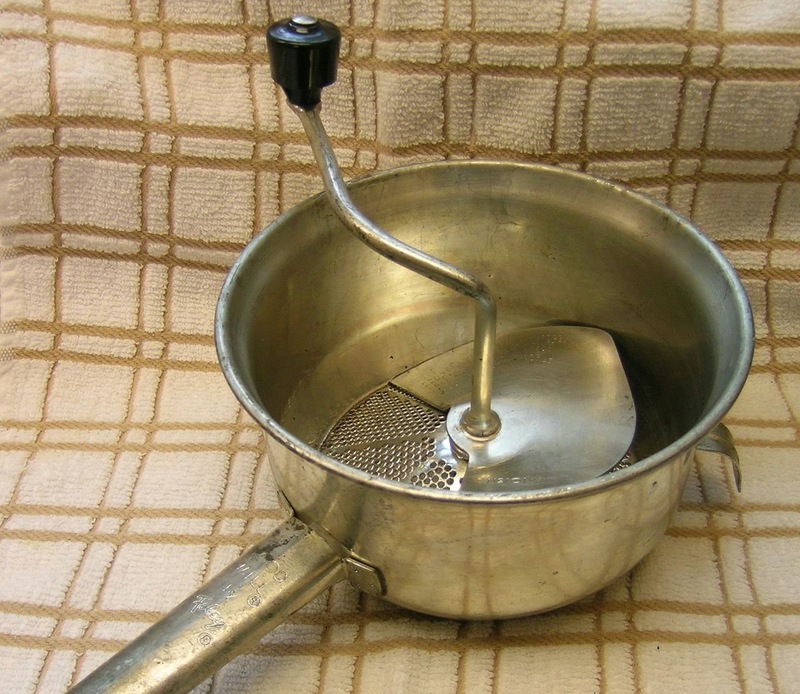 A food mill is a great tool to rough up seed coats. Put the seeds in, rotate the handle 10-20 times, and shake out the bits of seed coat that were scraped off. I've tried one, two, three, up to thirty days of soaking, and also hung mesh bags of seeds in the water tank of the toilet. By weighing the seeds day by day as they soaked, I tracked the uptake of water, watched the seed coat loosen, and in some cases, saw the radicle (the proto-root) emerge. Yes, those are emerging proto-roots and shoots on PC Iris seeds. They were scarified and soaked in water, and burst out of their seed coats, ready to grow. Here's a new method to try––one I plan to test next year: Soak seeds in cold tea. [I decaffeinate tea at home by steeping loose tea leaves in boiling water, use a French coffee press (or a sieve), time the steep for 45 seconds, pour off the water (save it for seed soaking), add fresh hot water to steep for the cup of tea to drink.] When soaking Iris seeds, change the cold (not hot!) tea every day. 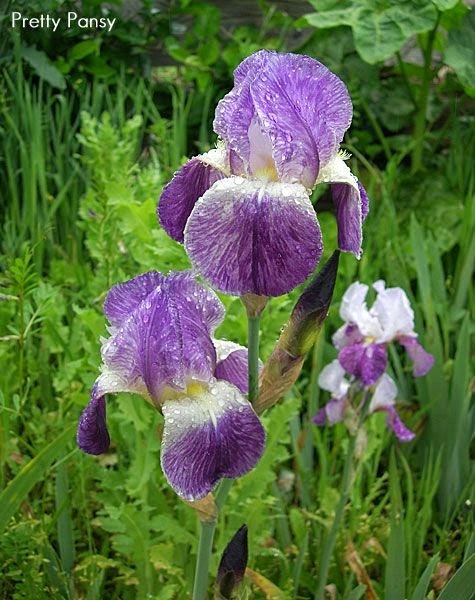 For some kinds of irises, this acidic, tannin-rich water seems to help remove germination inhibitors. And it allows you to enjoy teas even when you can not tolerate caffeine––which happened to me last year very abruptly after a lifetime of drinking fully-loaded black teas. Choices for potting PCI seeds are wide. Any container that can hold potting soil and drain off water will work. I've migrated to large rectangular styrofoam boxes (AKA fish boxes) over the past few years. I punch holes in the bottom, fill with a 1:1 mix of coarse pumice and potting soil, put the seeds on the top in rows, add labels, and a covering of chicken grit (usually granite). Then the planters go outside for the year––and no matter what the weather, they stay outside. I put them on the east side of my house where they get rain, wind, snow, a half day of sun, a rain of conifer needles, the occasional tree branch, and are close to a hose bib for summer watering. The seeds and subsequent seedlings spend a year in this container. This way, they have cool deep root runs, and are fine for their second winter. They are planted out the second spring, about 15 months after planting. Styrofoam boxes have drain holes; there's a layer of chicken grit (in this case a reddish granite) over the top, and then wire mesh to keep the squirrels and jays from the seedlings––both of these 'varmints' like to eat sprouting Iris seeds. I practiced fall planting of seedlings for years, until I lost ninety percent of them a couple of years running to mid fall snow and freezing weather. Now I wait for early spring, and plant out sturdy year old plants instead. 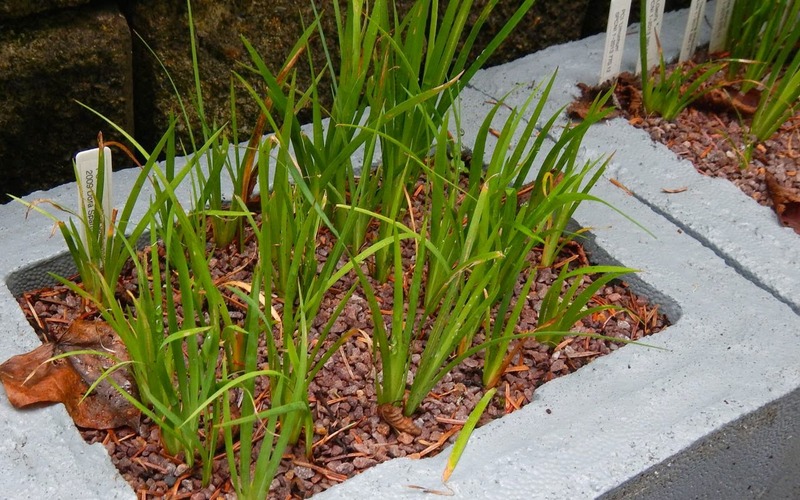 Waiting for spring: the next crop of PC Iris seedlings are ready to plant. Sturdy, healthy, they will be fine for the rest of winter in these styrofoam boxes, with 9-inch deep root runs and good drainage. 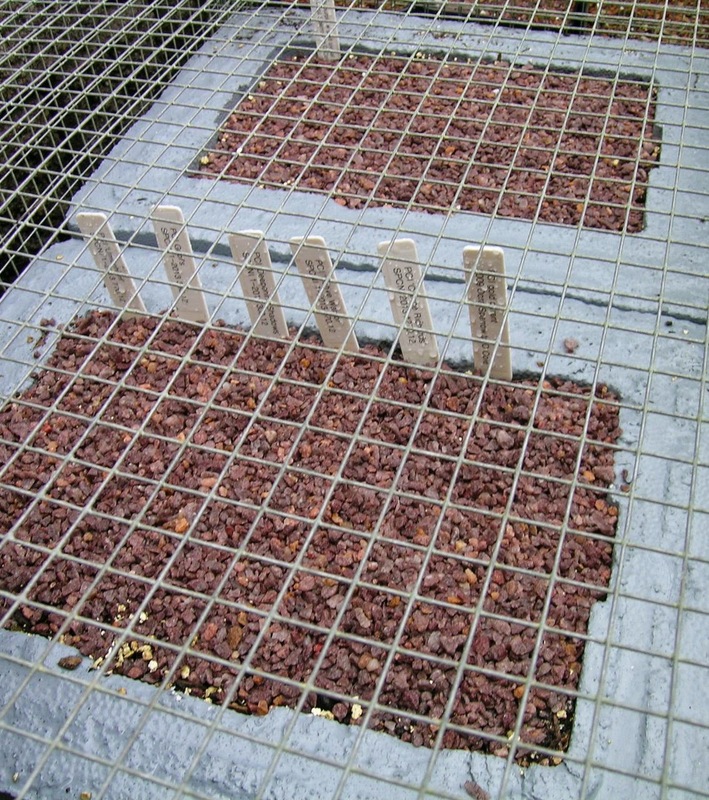 My methods for seed germination are in place for the new year, including a test of a new method. What are you planning to do? First of all the term "black' must be explained. Black iris are those iris that are so color saturated that they appear nearly black to the naked eye. 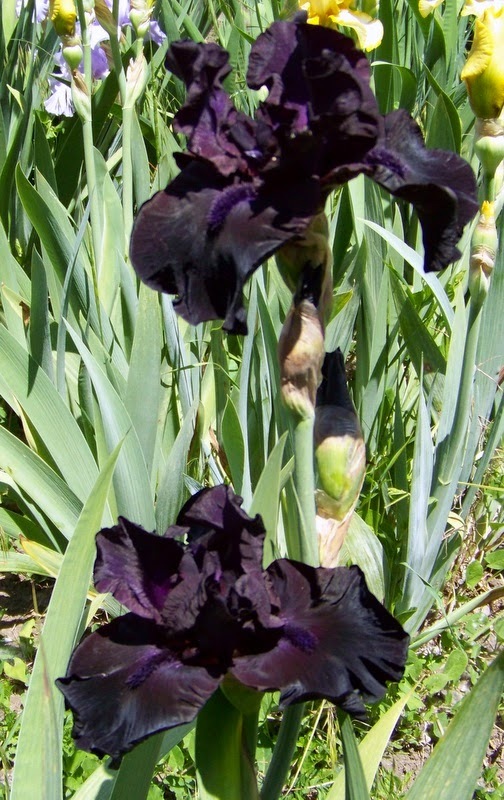 If you are looking for a black iris that has no underlying color in it you will be disappointed. Once you get sunlight on a so-called "black" you will see other colors within it. Cameras often see colors that the naked eye didn't at first pick up. There are blue-blacks, purple-blacks, and even red-blacks. This photograph was taken June 1st 2009 in our garden at peak bloom. In the photograph above you will notice pockets of very dark color. Those are my "blacks". I think they add nice contrast to the surrounding iris. You can create striking beds by planting black with white, black with red or orange, black with yellow and black with pink. This was probably my favorite black iris this year. This iris wouldn't be nearly as interesting if it didn't have that striking beard. A friend on Facebook asked me to describe the color of the beard. The beard is dark purple where it touches the falls but quickly changes to almost white with a dusting of yellow gold on the tips of the beard. These flowers are in our front landscape. Note how 'Swazi Princess' makes the pinks look lighter and vice-versa. 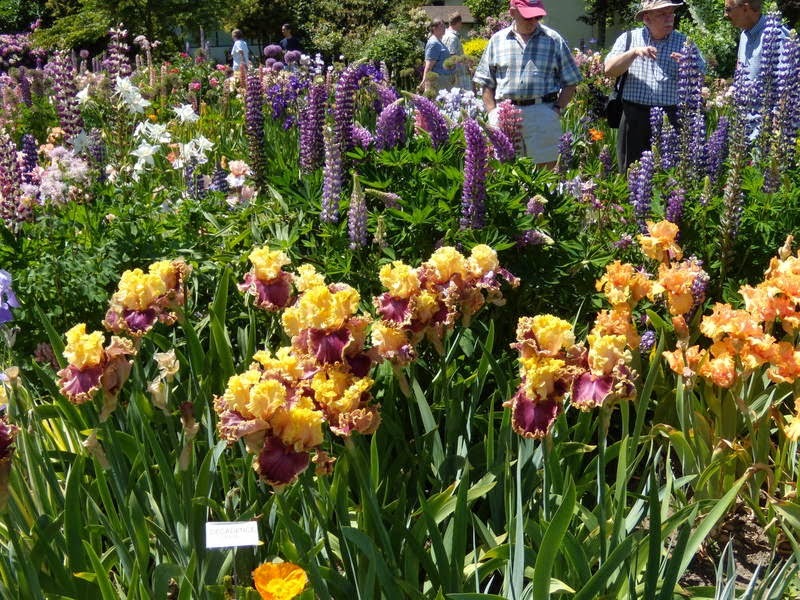 Next to 'Swazi Princess' are pink lupines and the tall bearded iris 'Beverly Sills'. This is the first year for this one to bloom in our garden so I don't know if it will always have all three blooms open on the same stem at the same time or not. This is a new addition to the "black" arena. It is an all over black self with just a few light white stripes parallel to the beard. 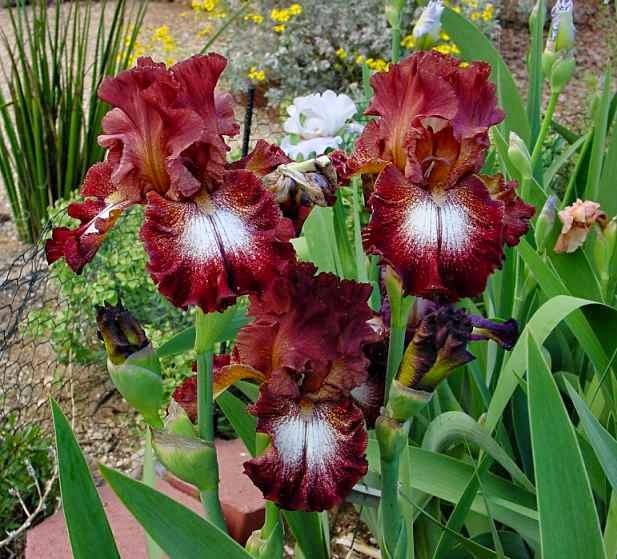 Here is an example of very dark red/black in the falls of this iris. This amoena,(white tinted standards with colored falls) really catches your eye. 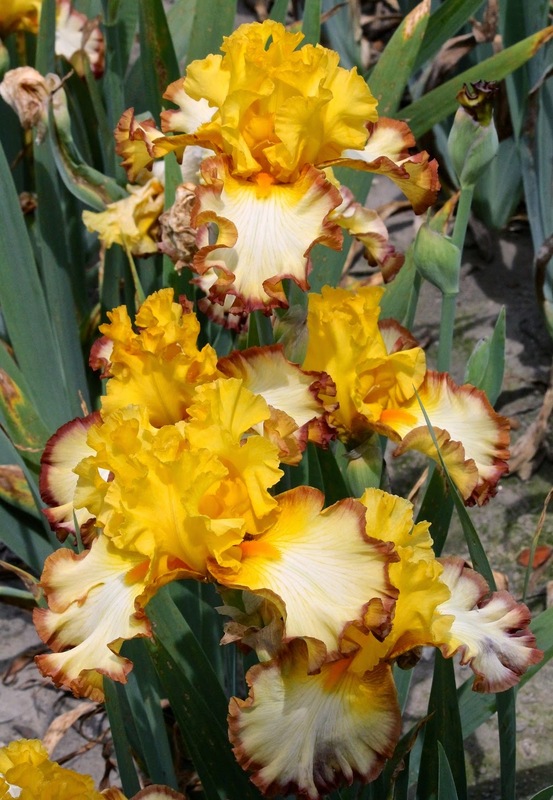 This iris won the HM in 2002, the AM in 2004 and the WM in 2007. This iris really looks very dark in the patch. It has attractive grape colored beards. It is a child of the Dykes Medal winner 'Before the Storm'. This one is fragrant too. Because of the substance, this iris seems to absorb the light instead of reflecting it. That makes it appear darker. This beauty is a child of 'Superstition' X 'Raven's Roost' . I grow both of the parent plants and am not surprised that they made such an attractive child. 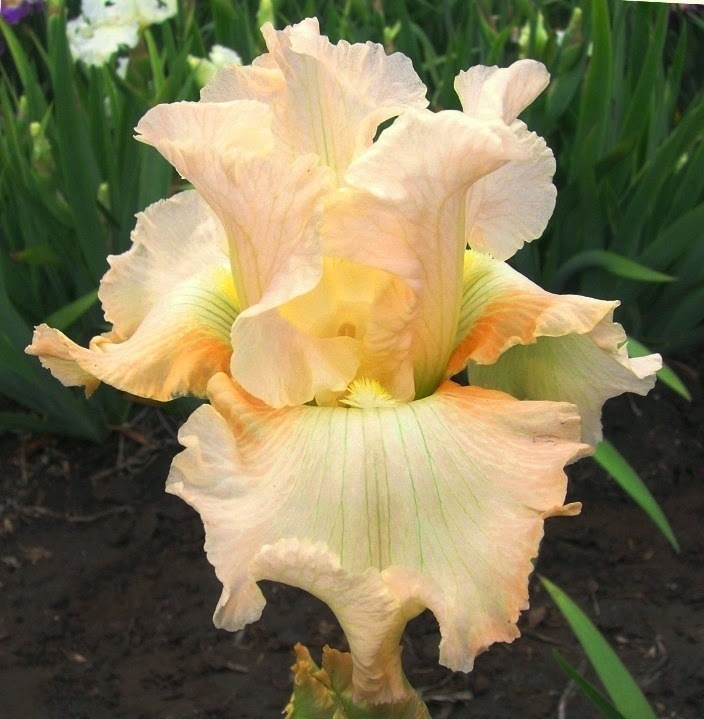 This iris won HM 1991, AM 1993, Wister Medal 1995 and the coveted Dykes Medal in 1996. This one is another purple/black self. The beard is dark purple but the falls are much darker. I love the form and substance. When it was introduced in 1992 it was said to be the biggest black flower and the most black. I think others have surpassed it in color since then. It won HM 1994, and Walther Cup in 1994, the AM in 1996, the Wister Medal in 1998 and the Dykes Medal in 1999. It is a deep red-black self with beard brown tipped blue violet. 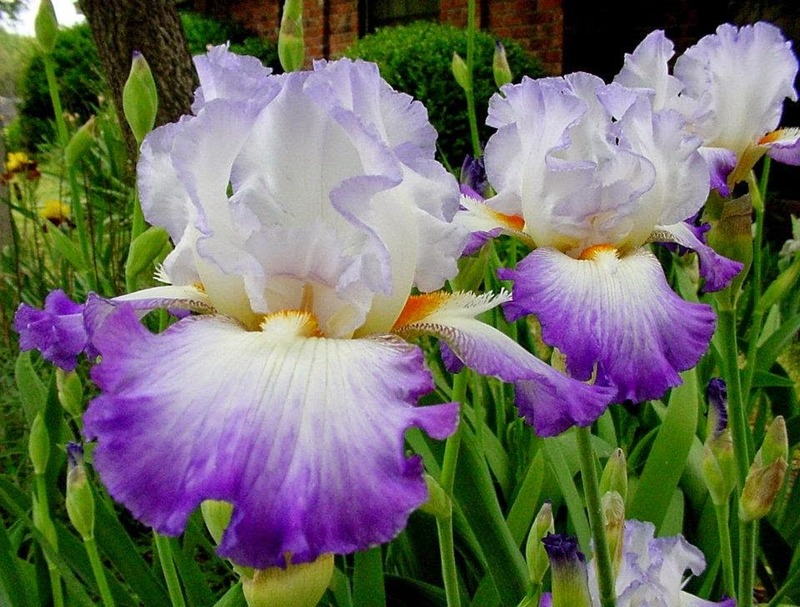 This is one of the irises that is considered a historic. "Historic" means it has been 30 years or longer since it was introduced. 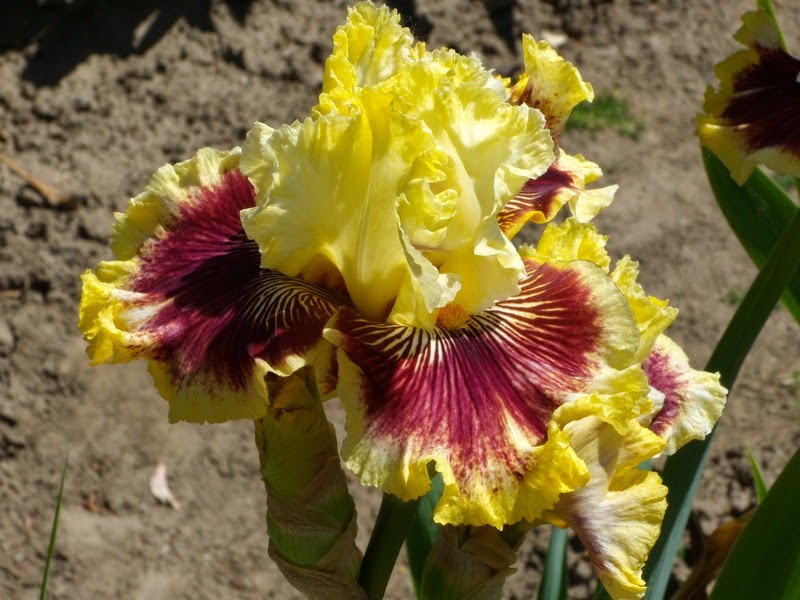 Another historic, this iris opens three flowers at a time. It has a hint of maroon. My camera lightened it up quite a bit. We bought a new much nicer camera this month and so next year I hope to get better resolution and truer colors. 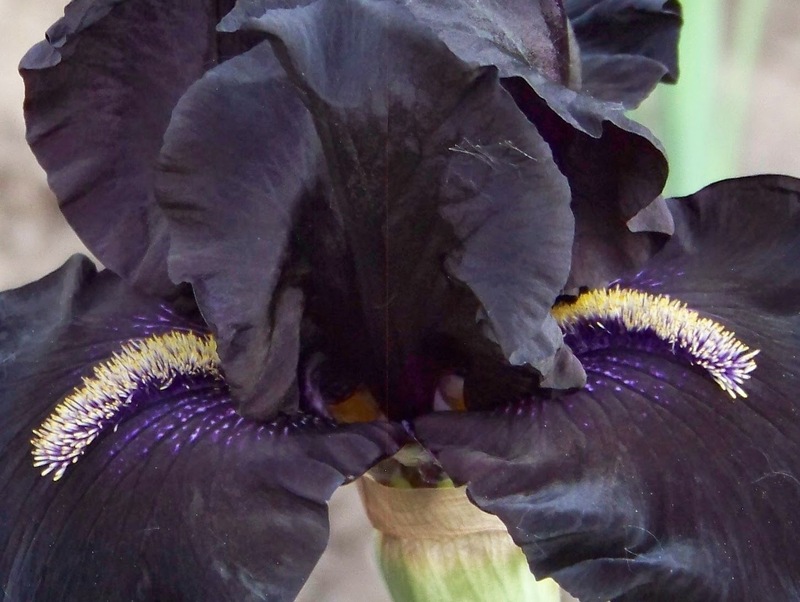 This iris is a deep inky purple with a pervasive black sheen. I love its form and ruffling. 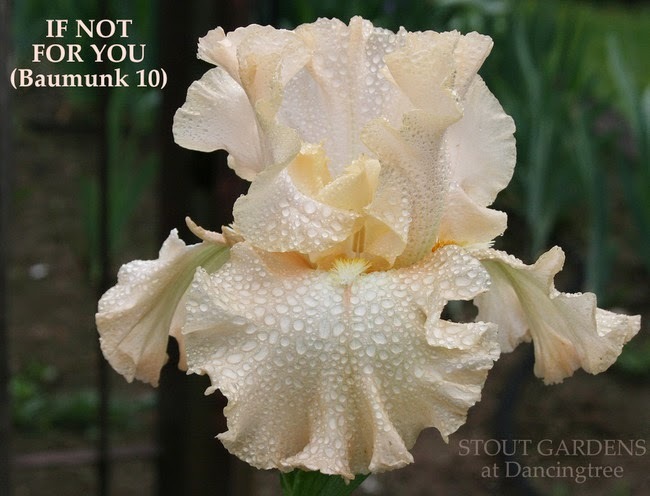 This is an outstanding iris that will always have a place in our garden. 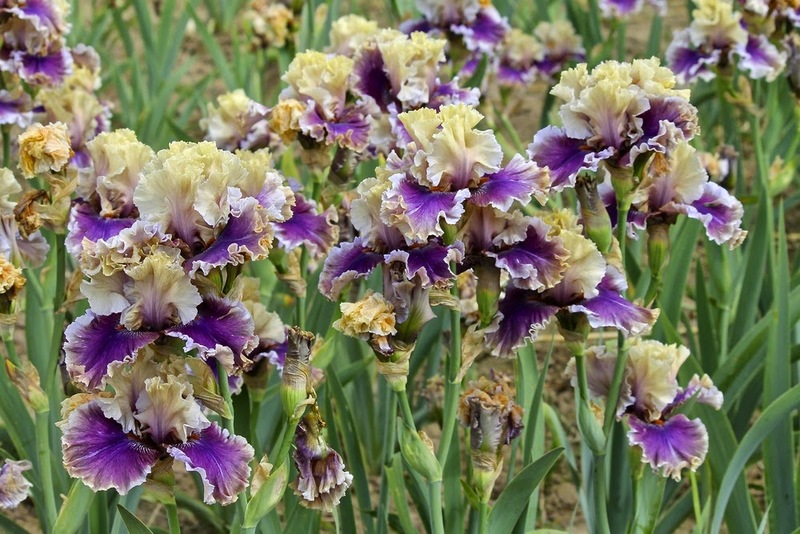 This iris is typical of the new improved blacks. This is a cross between 'Hollywood Nights' and 'Black Tie Affair'. 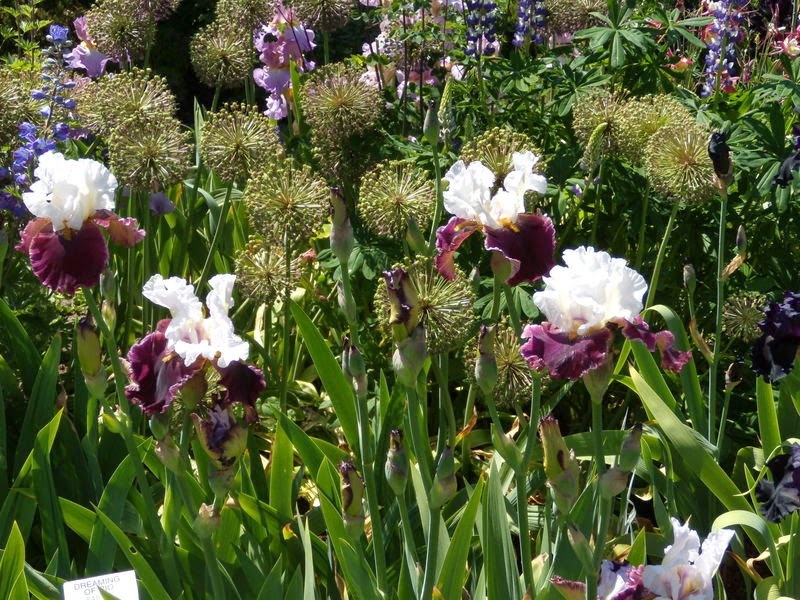 The iris to the right is 'Sweet Serenade'. 'Before the Storm' is one of the parents. Award of Merit in 2010. All of you in the southern hemisphere can enjoy your flowers right now and smell their fragrance. 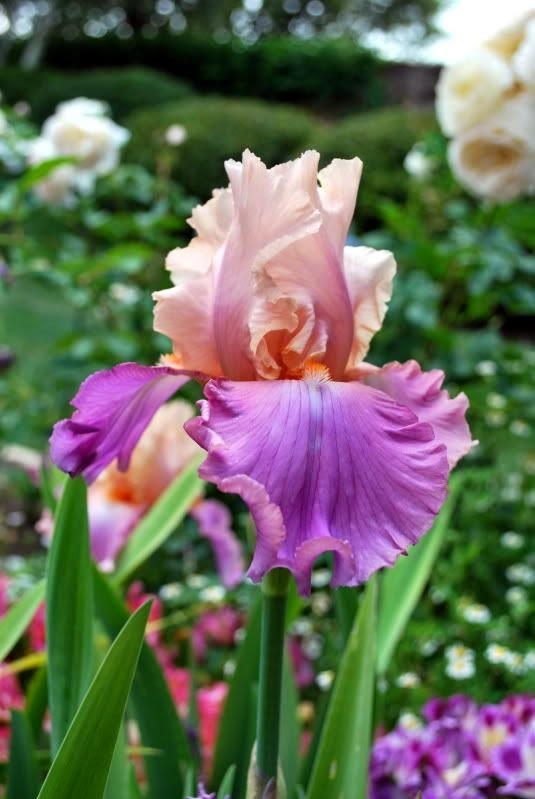 Here in the northern hemisphere, we can only enjoy ours by going back through pictures and remembering how stunning they were and what a wonderful hobby growing irises is. 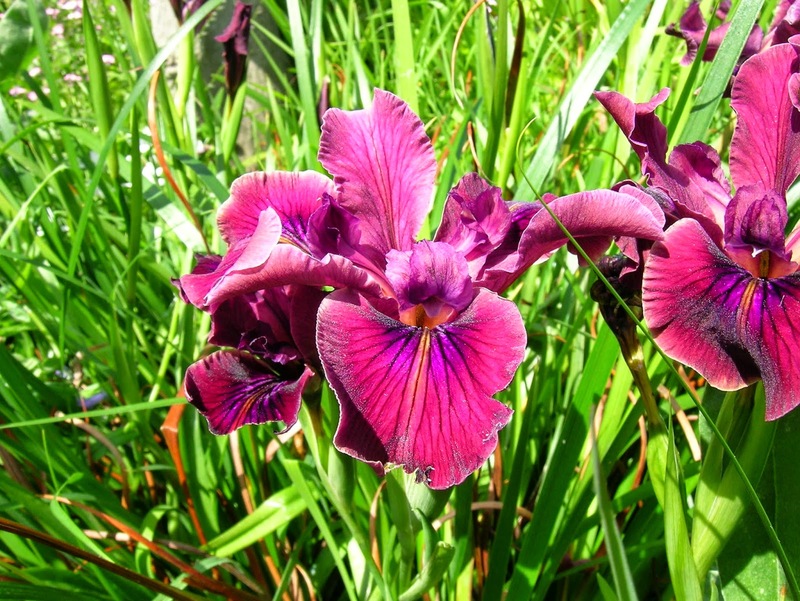 Do you have black iris in your garden? What colors do you like to pair them with? I would love to hear from you. 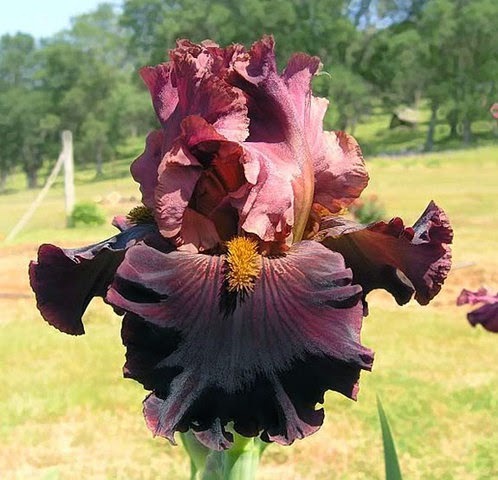 For more black irises, visit Mike Unser's post on historic blacks here. 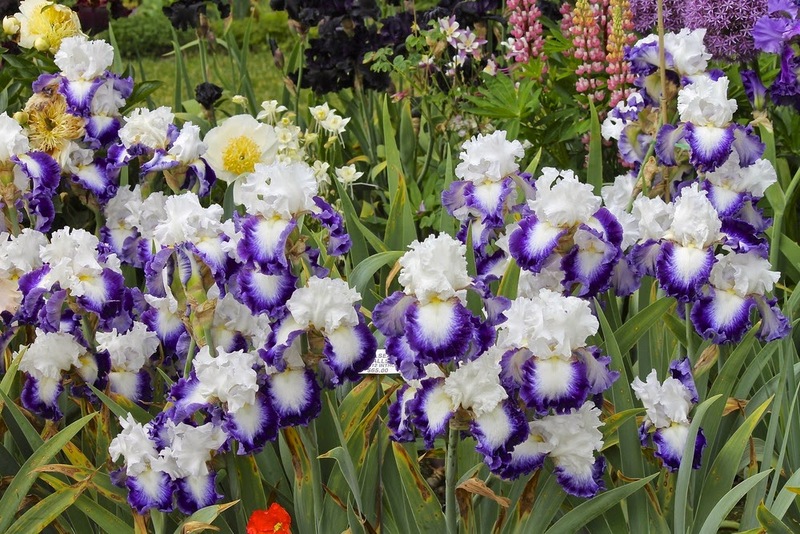 For those of us still new to the world of irises, there is much vocabulary to master. 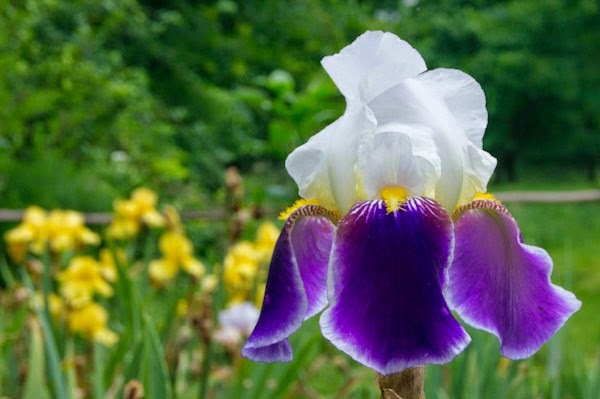 The parts of the iris flower, the different species of irises, the parts of the plant itself, and of course, the specialized terms categorizing irises into color types. Here is a quick reference, with photographic examples, of some of the major color terms you will encounter while reading about your favorite flower. The falls and the standards of a self are the same color. 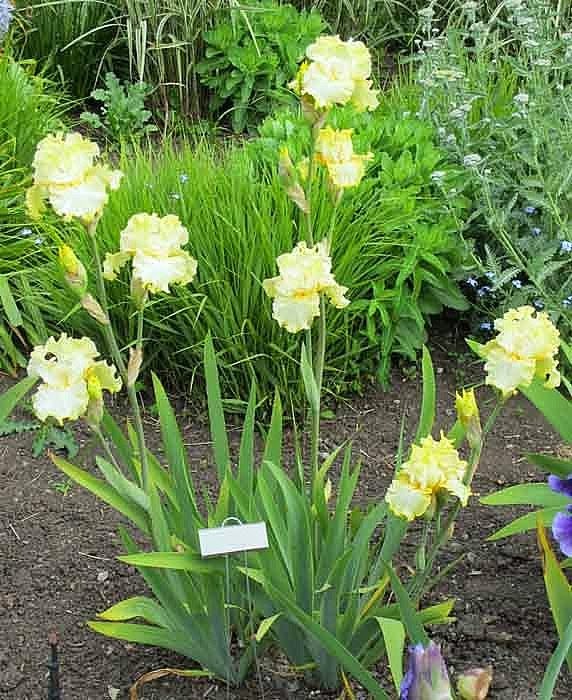 These irises really stand out in a garden setting and are wonderful companions to other plants. Plicatas have stippled, dotted or stitched edges on a white or yellow ground. I love the white ones with the pretty picotee edging the best. The Plicataman himself, hybridizer Keith Keppel, contacted us to remind us that the definition of a plicata as having a white or yellow ground needs to amended, "as hybridizers have worked hard and we now have lots of plicatas with pink or apricot ground, and we're working to intensify the depth of color so you can really say 'orange, and mean it!" For more on plicatas, click here. Amoenas have colored falls and white standards. The most famous is probably, and justifiably, 'Wabash', pictured below. To see another post on amoenas, click here. An iris with red falls and yellow standards. 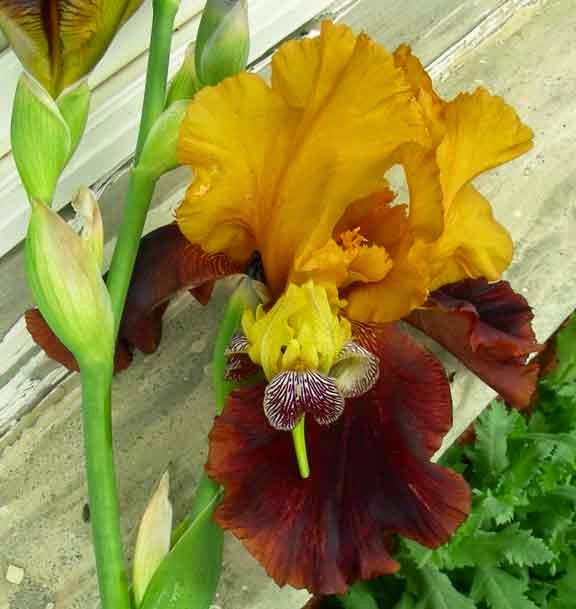 My very favorite photo of this color, below, shows the cultivar 'Supreme Sultan' with its earliest progenitor, the original iris variegata. 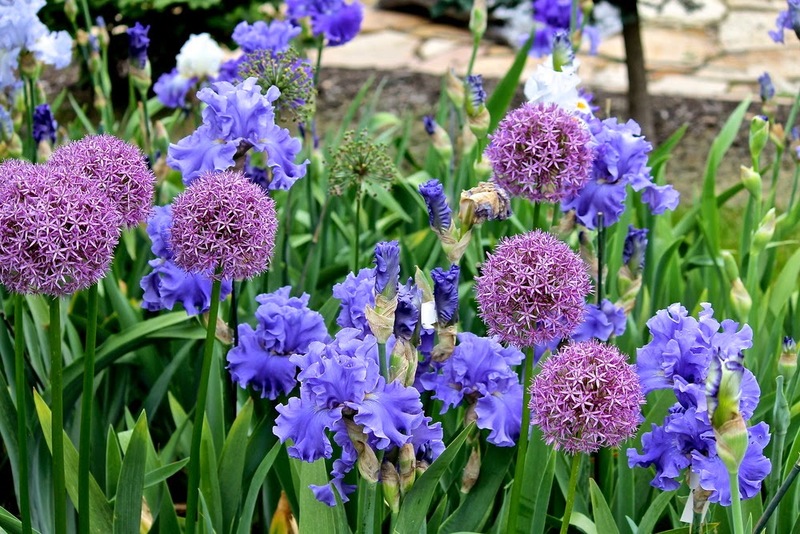 Can you believe what modern hybridizing has accomplished? 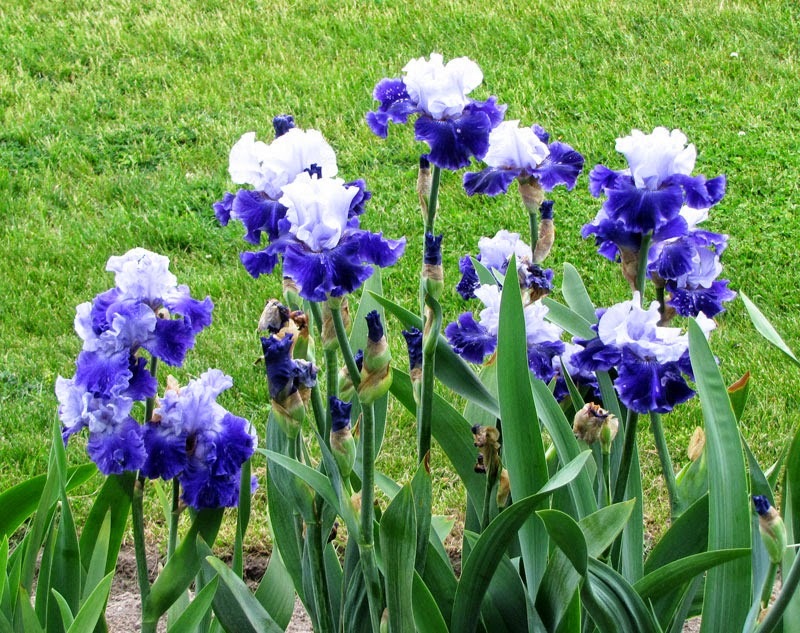 A blue or purple-blue bitone iris with lighter standards. Click here for more photos of neglectas. 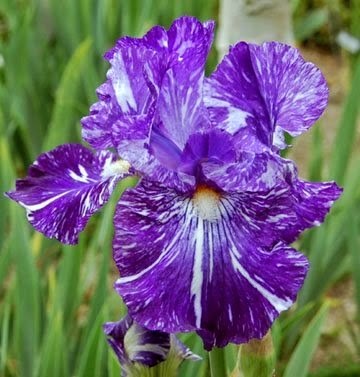 An iris with no purple anthocyanin pigment. These irises often seem to glow. The colors remind me of that wonderful "polychrome" daylily color. Another glowing iris type, the luminata, is an iris with a white or yellow base washed over with color so that it appears to glow from within. More luminatas can be found here. 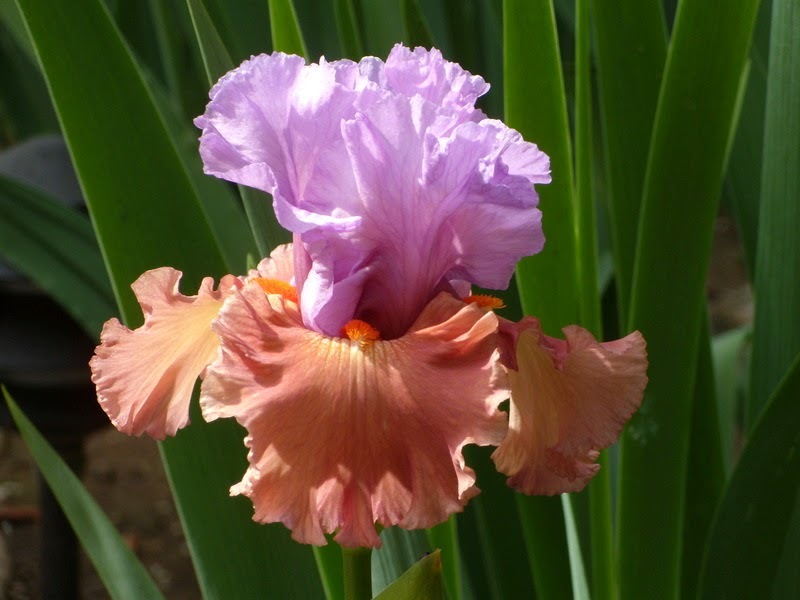 This is an iris which has standards and falls of the same color, but the standards are a lighter shade than the falls. An iris of two colors. These flowers have splotches, blotches, and streaks in random patterns. For more broken color irises, click here. A darker ring of color around the falls of the flower is referred to as the Emma Cook Pattern, which is named after this famous ground-breaking cultivar. 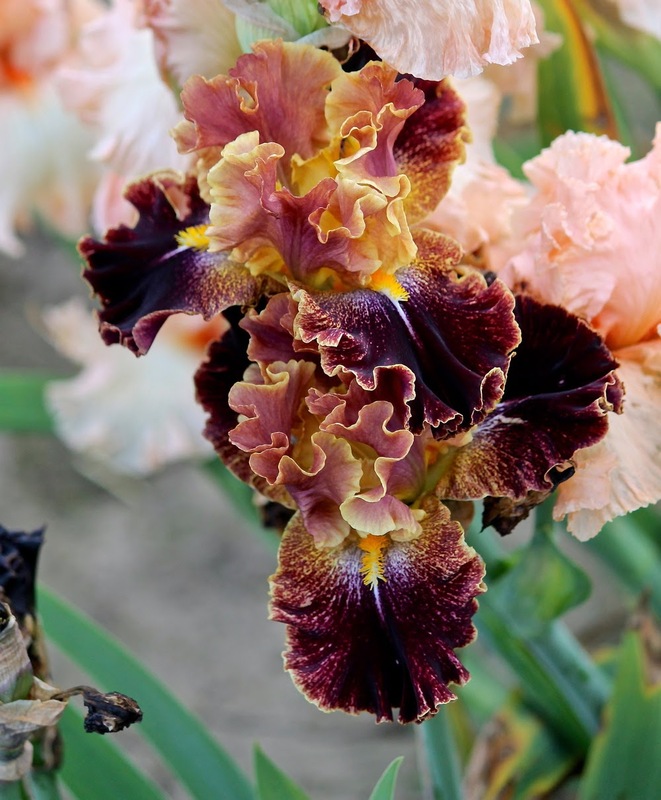 Many new and exciting color combinations and patterns are emerging in the world of iris hybridizing, so many that it's hard to figure out if they fit into an existing category or if new ones should be created. I am partial to amoenas. Which is your favorite?